A commercial photography assignment for the Madison, WI Rhythm and Booms created unique opportunities and challenges. Read more in this behind-the-scenes take. In this increasingly visual world, where photography is key to graphic design in marketing, we wanted to better understand how to make a lasting impression with graphic design photography. Callie Reger, a graphic designer at a marketing agency that specializes in direct marketing in both digital and print media, agreed to share her knowledge and insight. Callie's work involves large companies with existing marketing teams that tap into her firm's niche strengths, as well as smaller businesses that use the firm as consultants for every aspect of their business marketing strategy. "Choosing images for client campaigns is OUR NUMBER ONE DAILY STRUGGLE," Callie explained. "Traditional as well as social media platforms like Pinterest and Facebook demand strong photography and graphic design that is equally about appearance as it is about functionality. Yet, designers rarely get quality client-provided photography." "The low quality of these images makes them a poor choice for any application. Ideally, a graphic designer wants a TIFF file, at least 300 dpi, that will facilitate any needed retouching and color correction and still maintain a quality image. JPEGS have been compressed to reduce the file size of the image — retouching can still be done but there is not as much detailed information. We can always compress an image, but we can't enhance what isn't there." 2) Pulling a generic image off a "Google search"
"Photoshop® is a powerful program, however it has its limitations when working with poorly composed, compressed, or low resolution images. We can usually crop things out and adjust the image but we can't magically reattach limbs or rebuild a structure that has been left out of the shot." "When our client does not provide a collection of quality images suitable for different layouts, we can use images from stock photo agencies. However, a generic stock photo, though taken by a professional, may not be an accurate representation of our client's actual situation. Stock imagery might connect with the consumer on the direct mail piece, but not match their expectations when they walk in the door. There is also the risk of creating confusion in the minds of potential clients by using a photo that one of your competitors may also use." "When the goal is to sell the uniqueness of our client to the consumer, it is often more cost effective to hire a photographer to create a custom collection of images. A professional photographer has the technical skill to use the elements of art and well staged lighting to carefully craft high quality marketing images that will set your business apart from the competition." When asked to share the one piece of advice she would give her clients if they want a good graphic design marketing piece, Callie replied,"To be seen as a professional, it is important to create a professional first impression...It's worth the investment to hire a professional photographer who will create striking, high quality photography that will translate well to print marketing materials and web applications and thus attract clients." We thank Callie for taking to time to share these tips for selecting images for future graphic design marketing pieces. Thinking about your commercial photography needs? Contact us today for a consultation - we can help you stand out from your competitors and create a lasting impression for your customers. Marketing Your Business: Who Is Your Visual Protagonist? Protagonist is defined as "chief actor," "one who plays the first part," or "one who plays the leading role" in a novel, movie, play, or other fictional medium. When marketing your business, creating your small business advertising plan or choosing photography for small businesses, it is important to think about who will be your protagonist and how you will tell your company's story not only in words but visually. Think of a few iconic marketing protagonists that we are all familiar with. Characters like "Flo;" as soon as you see her blue headband and white apron you recognize her as the Progressive Insurance® spokesperson. Or when you see a photo of the Travelocity® roaming gnome nestled in some idyllic location, do you wonder where in the world he is and how you'd like to be in that picture too? And, what if I say "gecko." Do you say "GEICO®?" Sometimes the company protagonist is simply a logo — think of Target®, Nike®, or Pepsi®— did you picture the red and white bull’s-eye, the "swoosh," or the red, white, and blue circle? Or even just a single color, such as the orange used for ING® Financial Services? No words necessary. Visual storytelling at work. For non-profits and medium or small business advertising and marketing though, the owner, CEO, or founder may become the "face" of your company. You may hang your name on just one product and that becomes the image of your company. Can a product itself be the visual protagonist? Yes! But it must take on a persona of its own. Or perhaps you choose to use customer testimonials for marketing your business. Each of these is a protagonist – the leading subject that tells your organization's story. Yet, remember that the protagonist "plays the leading role." Choose your starring character and how you present it to your audience wisely. Think of an amateurish customer testimonial commercial you’ve seen in the past. Did it make you think highly of the company presenting that message, or did you wonder if perhaps they might be just as unprofessional as their spokesperson? Humans are a visual lot, that is why the Travelocity® gnome or the Nike® "swoosh" do not need any words to go with them. You want to create the same instant recognition, so when creating your advertising and marketing materials, choose high quality, professional photography for small businesses to make your story come alive in potential customer's minds. A picture truly IS worth a thousand words. Sure, there are many stock images available online, but were any of those images designed to tell your story? Will they create that memorable connection in a potential customer's mind when they see the same image in someone else's advertising too? Not likely. They might even be the same stock images that your competitor is using, which can dilute brand recognition. When you take the time to "plot your story," truly thinking about the image you wish to project, and then deliberately create that image through a smart tag line and photography specific to your company, you will stand out from the crowd. Like that gecko, you will create a memory in the viewer's mind that is unique to your company alone. That visual image — the one that shouts your company's brand and yours alone — that is your protagonist and you can only get that with professional images created just for you. Focal Flame Photography is in the visual storytelling business. On any commercial photography assignment, before we make a single image, we spend time with you, get to know your plans, your goals, help you select your protagonist, and plot out the story you wish to tell. Then we set about telling your story in expressive, compelling images. Using imagery with high stopping power will enhance your marketing message and capture the attention of viewers. 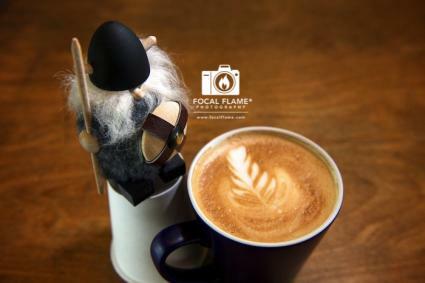 To learn more or to discuss how Focal Flame photography for small businesses can help you enhance your business image, contact us. In every story there is a protagonist — who or what is yours? Share your experiences! Focal Flame Photography had the honor of creating a media library of commercial photographs for SportCrafters, a Granger, IN-based cycling products company dedicated to designing and manufacturing trainers and bike accessories. While creating images to support the product launch of the Omniumbike trainer, we were fascinated to learn more about the Omnium and the flexibility that it offers to cyclists. If you are among the relatively small percentage of cyclists who use roller trainers, you already know what "rollers" can do to improve technique, power, efficiency, and handling skills. You might even wish you could take your trainer on the road with you for warm-ups before every race. If you are a novice or intermediate cyclist though, just racing for the thrill on weekends, you may wonder, "What is so important about a pre-race warm up?" Sarah Houser, marketing manager at SportCrafters, one of the premier manufacturers of cycling,trike, and hand cycle trainers and accessories, explains, "Taking the time to warm up before a race and achieving, in that warm up, the maximum effort you will put out during the race are critical to your body's performance, especially for cyclocross, criterium, mountain, and road racing. When you have to be ready to rocket out of the start, you can't waste time easing your way into the race." In an article on the importance of a good warm up and how to attain it, Bicycling Magazine, suggests pre-race warm ups as a way for older athletes to keep up with or gain a competitive advantage over younger racers. Read the article here. The people at SportCrafters know competitive racing and the importance of a good warm up. That is why they created the "Omnium," the first folding race warm up trainer that you can take with you to any race, anywhere. Despite its super compact size, it offers the advantages of a much larger warm up trainer, yet packs into a TSA friendly carry-on. What are the advantages of the Omnium over other roller trainers? Less wear on the tires compared to rear-clamp trainers. The rear wheel only design and smooth SportsCrafter drums mean you can leave your race wheels on when using the Omnium. No risk of chain alignment issues, since there is no need to remove the rear wheel or skewer to use the Omnium. You get the same power profile as a fluid stationary trainer. The faster you pedal the Omnium, the more resistance you feel, so you can get the full benefit of varying the intensity of your workout even on race day. 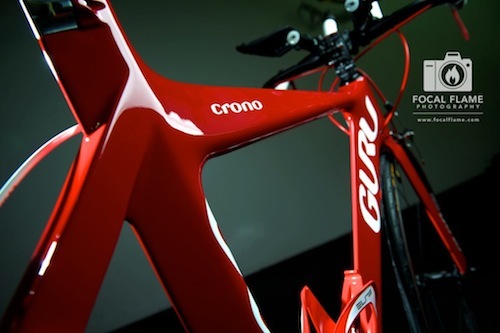 Bike shops can use it to test any type of bike — road, mountain, time trial — the Omnium is so highly compatible that bike shops use it to help customers try out a variety of different bicycles. Lightweight and portable. The Omnium folds up to a very small, easy to take with you size. Pack it in your backpack or carry-on and take it on business trips, vacations, or when traveling to races. The Omnium meets FAA regulations for carry-on size luggage, so you can take it with you to races across the country or around the world. Houser reveals that the name, "Omnium," comes from the Latin "omni" which means "all" — "because it is a trainer that is suitable for all bikes, all seasons, and all purposes." She adds, "The Omnium is so small when folded, it is convenient to store, pack, and carry, even on an airplane, and thus perfect for the competitive athlete who travels." If you would like to try out the Omnium, it will be on display at Interbike, an annual, by-invitation-only "everything biking" event for the cycling industry. 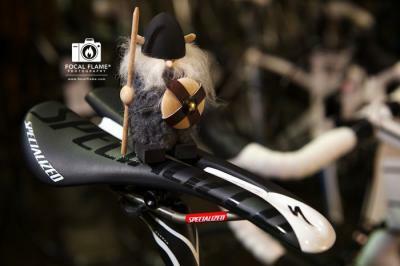 If you did not receive an invitation, don't worry — you will soon see the Omnium at a SportCrafters dealer near you. For more information, visitSportCrafters.com . Do you train with rollers? How would you use a SportCrafters Omnium to improve your technique? Share your thoughts! It is said that "A picture is worth a thousand words." If you are an advertising or marketing professional, you know the truth of that statement. If you aren't, close your eyes and image a bottle of your favorite beverage sitting in front of you. What do you see? Is the top off? Is a little puff of fizz visible? Perhaps there is a drop of water sliding down the bottle's frosty side? Are you thirsty yet? Yes? That is commercial photography in action - creating desire in the viewer for a product, service, or experience. Big business knows that the visual storytelling power of commercial photography will enhance their brand and image. If you are a small business owner or a non-profit agency though, you might be saying, "Yeah but...they're the big guys; they have deep pockets. Commercial photography is not for me." But think about it — do you have a Website? Do you create brochures, advertisements, flyers, annual reports? Do you want to showcase your people, products, services, or mission in your display windows, showroom, lobby or board room? Do you sponsor special events? Do you use Facebook,Pinterest, or other social media channels? If the answer to at least one of these questions is "Yes," you need commercial photography just as much as the big guys, perhaps even more so. 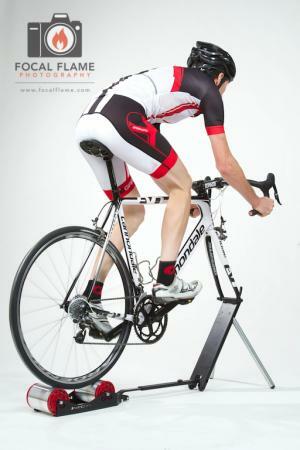 Peter Oyen, owner of Rocket Bicycle Studio, understands the value of commercial photography. He hired Focal Flame photographer, Clint Thayer, for several commercial assignments to capture images of custom-made bicycles designed and built for individual clients. Some of the resulting photos have been used for prints for clients that are received upon pick-up of their long-awaited bike. Others have been licensed for use in web and e-marketing. A series of canvas wraps were created to provide unique, customized interior decor in the facility. Why did he make the investment in commercial photography? Oyen answers, "We have used Focal Flame Photography for multiple situations. Pictures for our website. Large canvas photography for our studio. Which by the way, we continuously receive many compliments about. Focal Flame works so hard to help RBS stand out!" Bell Giftos LLC, a Madison, Wisconsin law firm, wanted to portray a sense of professionalism yet approachability appropriate to the firm’s client-centered methods. They licensed black & white photographs by Thayer, for use in web and electronic marketing of the firm. The Bicycle Federation of Wisconsin engaged Focal Flame Photography to create a series of images to be used in a bike advocacy media campaignpromoting the value of the bicycle as a means of transportation. The images, shot at multiple iconic Madison locations, were licensed for use in advertisements that ran in local newspapers and magazines, and appeared in newsletters, on billboards, and other key Madison locations. Amanda White, Associate Director at the time, stated,“Using a skilled, professional photographer to shoot local, Madison sites was vital to our campaign. The images are central to the campaign and the most powerful aspect of the ads." The Madison Area Sports Commission needed engaging, compelling photographs for their media files that would portray both the journeys of athletes and the experiences of spectators, volunteers, and sponsors at local events. The resulting photo essays were licensed for electronic and print use and are regularly shared with media outlets and prospective clients. For more about these organizations and how they used commercial photography to enhance their image and tell their story read our commercial case studies. Close your eyes. Can you imagine how commercial photography will help tell your story? Whether you desire to project a professional business image or create eye-catching sales and promotional materials, quality commercial photographs will set you apart from the crowd. Professional headshots will help build relationships with potential clients or customers. An experienced photographer covering your special event will assure memories not forgotten. An artfully composed photograph of your product will stand out in advertisements and make a statement on Pinterest, Facebook, or other social media sites. Make a library of artful, engaging digital photographs created by Focal Flame Photography part of your vision. We will create personalized, custom images that showcase you, your business or agency, your mission, and your goals to have on hand so you can always make your best impression. How would a media library of photographs help you connect with your customers or target market? Find out -contact us today.